Issues of sustainability and increased competition over coastal resources are changing practices of resource management. Societal concerns about environmental degradation and loss of coastal resources have steadily increased, while other issues like food security, biodiversity, and climate change, have emerged. A full set of social, ecological and economic objectives to address these issues are recognized, but there is no agreement on how to implement them. This interdisciplinary and "big picture book" – through a series of vivid case studies from environments throughout the world – suggests how to achieve these new resource management principles in practical, accessible ways. An epic work of open-minded scholarship that bridges disciplines and schools of thought in seeking a new, interdisciplinary philosophy and science for managing coastal social-ecological systems. Berkes throws down a respectful challenge to disregard futile searches for universal panaceas and rather to draw on collective wisdom for case-by-case, adaptive solutions. This book should be read by all working on sustainable use and livelihoods in coastal environments. This excellent book is a must-read for practitioners, students, and the public concerned with the management and sustainability of marine and coastal systems. It provides the conceptual and practical foundations for teaching interdisciplinary science for the coast and social-ecological system based management; the global examples and extensive web links are especially useful. This book will change your paradigm. -R. Ian Perry, Canadian Department of Fisheries and Oceans and the University of British Columbia. Fikret Berkes has again written an important book for students, researchers and policy makers around the world. In this new contribution he draws on his long and pioneering career as an interdisciplinary scholar and broad international research experience with regard to natural, mostly marine and coastal resources and their governance. Not only does he provide a nice overview of the shifting paradigms and practices of managing access and use of common pool resources, he also provides critical thought on the current debate about market-based approaches to resource governance that are now spreading globally. For those searching for alternatives, Prof. Berkes offers fodder for thought and hope for future sustainability of our coasts. 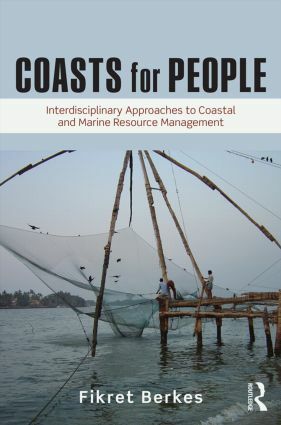 This book brings together a lifetime of experience, knowledge and wisdom about coasts, people and their management. Drawing on cases from across the world, Fikret Birket provides a comprehensive, cutting edge and unique text on new thinking and approaches to managing coasts. This book is essential reading for students, scholars, practitioners and policy -makers concerned about managing coasts for a sustainable future. Fikret Berkes is Distinguished Professor and Tier 1 Canada Research Chair at the Natural Resources Institute, University of Manitoba, Canada. His studies on community-based resource management and the use of commons in a number of regions of the world have led to insights regarding the management of coastal and marine resources. Dr. Berkes has authored some 250 peer-reviewed journal papers and chapters and ten books, including Sacred Ecology (Routledge, 2012), Navigating Social-Ecological Systems (Cambridge University Press, 2003), and Managing Small-Scale Fisheries (IDRC, 2001).